Burn Ban Status: There IS NOT currently a BURN BAN in Rockwall County. Before any burn call the Rockwall County Sheriff’s Office @ 972-204-7001 to obtain permission to burn. 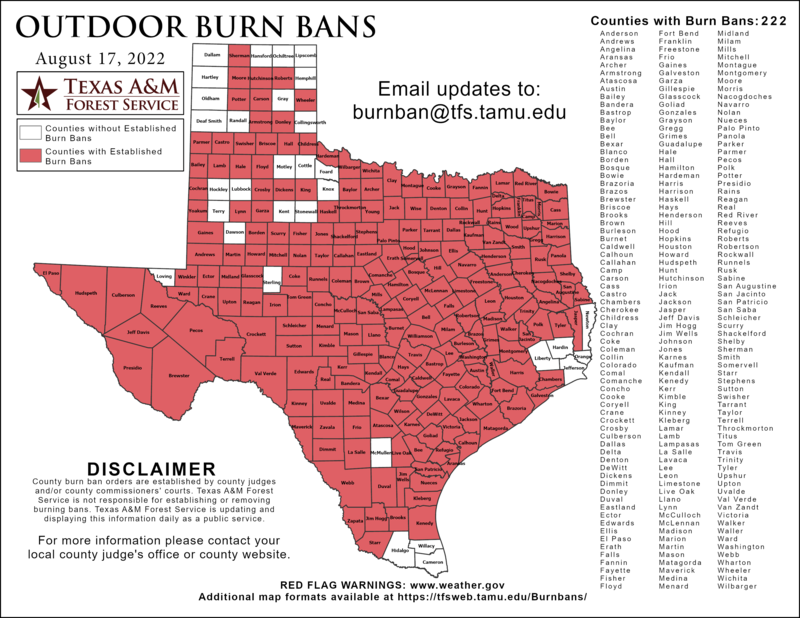 If Rockwall County enacts a “Burn Ban” on all outdoor burning. Petroleum products, Asphaltic materials, Items containing natural or synthetic rubber, Construction materials such as sheet goods, dimensional lumber including and pressure treated wood, household garbage / refuse (including newspapers and boxes). from complying with other applicable laws, ordinances or regulations. Your compliance with these guidelines will aid in preventing the unnecessary dispatch of the various fire departments in the county. The McLendon-Chisholm Fire Department is proud to announce that our ISO rating has dropped to a 4/9. This can lower home insurance rates and lower premiums. We plan to continue to provide the service that our citizens have come to expect.